pyMCU is an electronic board that can handle electronic components like various sensors (temperature, light, pressure, magnetic field, distance etc.) or for example small alphanumeric displays. All of that is done by code you can write in Python. 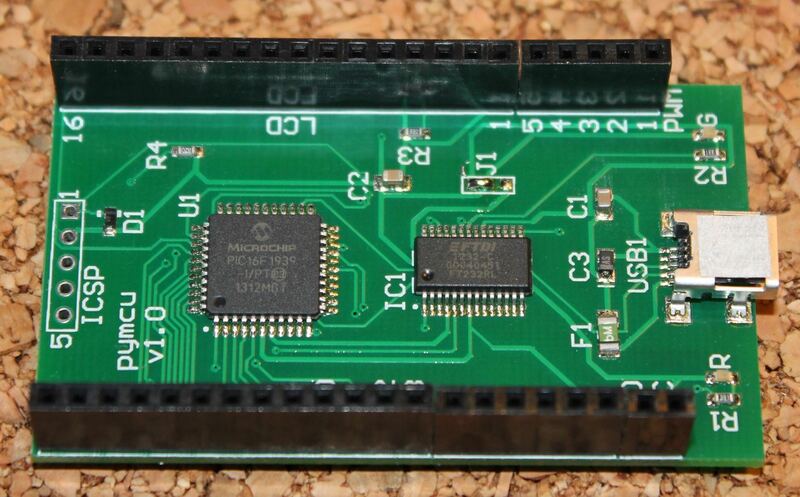 The board is equipped with a PIC 16F1939 microcontroller offering 13 Digital IO Pins, 6 Analog IO Pins, 5 10-bit PWM Pins, and a 16 Pin Parallel LCD Interface. The board can be connected to nearly any computer via provided mini USB port. There are drivers for Linux, Windows and OSX. You can find more information on project website. Compared to for example Raspberry Pi and other mini-computers this board isn't a computer and has no CPU or RAM like those mini computers. It's controlled from the computer to which it's connected. It can be a PC, laptop or also Raspberry and some other mini-computers. It provides similar features as Raspberry GPIO pins (or Arduino etc.). By default it uses 5V so it can be used as an addition to 3.3V Raspberry or to work with 5V Arduino components. A handy tool for you self-made electronics project. pyMCU can be ordered from the shop for around 20 EUR or $25. Is cheaper than Raspberry as it's a simpler board - no CPU, RAM or other peripherals. A "Hello World" for such electronic devices is to turn on and off a LED using some code. The LEDs have their voltage and current specified. Those parameters are important as wrong LED won't turn on or will burn quickly (stop glowing). As pyMCU uses 5V you must use a LED that has voltage lower than the 5V. You will have to also have an resistor to prevent it from burning. For a simple pick few hundred Ohms resistor will be good (or a potentiometer - where you can set resistance from a given range). Stronger resistors will make the light dimmer. Very strong resistors (a lot of kilo or mega Ohms) may prevent it from glowing. A lot of sensors like photodiodes, photoresistors or some temperature sensors are resistors that change their resistance (like photoresistor will change its resistance depending wherever it's dark or bright). Those simple and cheap components can also be used in simple circuits for practice. Note that there are also more advanced sensors that may require more complicated circuits to work (like some sensors in the shape of Arduino boards). If you will dive deeper into the electronics world you will need to solder some elements together. You will need a soldering iron, solder (tin) and rosin to do it... You can find some tutorials on Adafruit website and YouTube channel. 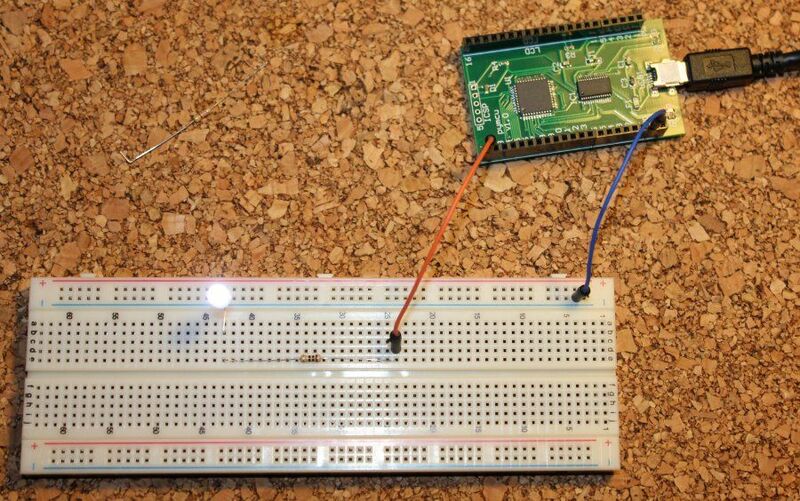 For circuits shown in this tutorial the breadboard and jumper wires will do just fine. 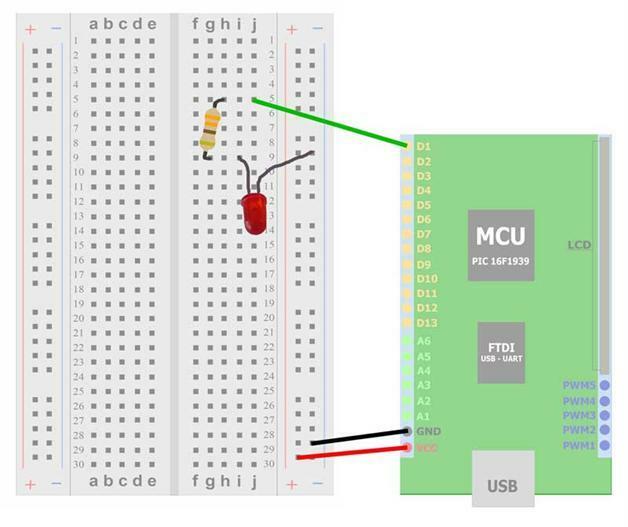 Blinking a LED is the first simple circuit you can do with pyMCU. It's available on the tutorials page too. LED will have a longer and shorter pin. Connect the shorter to D1 socket on pyMCU (via jumper wire and breadboard), and the longer one via resistor to GND socket. The resistor should have few hundred Ohms. You can try to calculate the minimal resistance from the equation (5 - X)/Y where X is the LED voltage and Y is the LED current. When the code starts the LED should start to blink. If it's connected the wrong way it wont. Under Linux you will may need to run the script via sudo or as root. In the Python code you are telling the D1 what to do, like change it's status (give current to power the LED or turn it off). You can connect a photoresistor or photodiode in the place of the resistor. 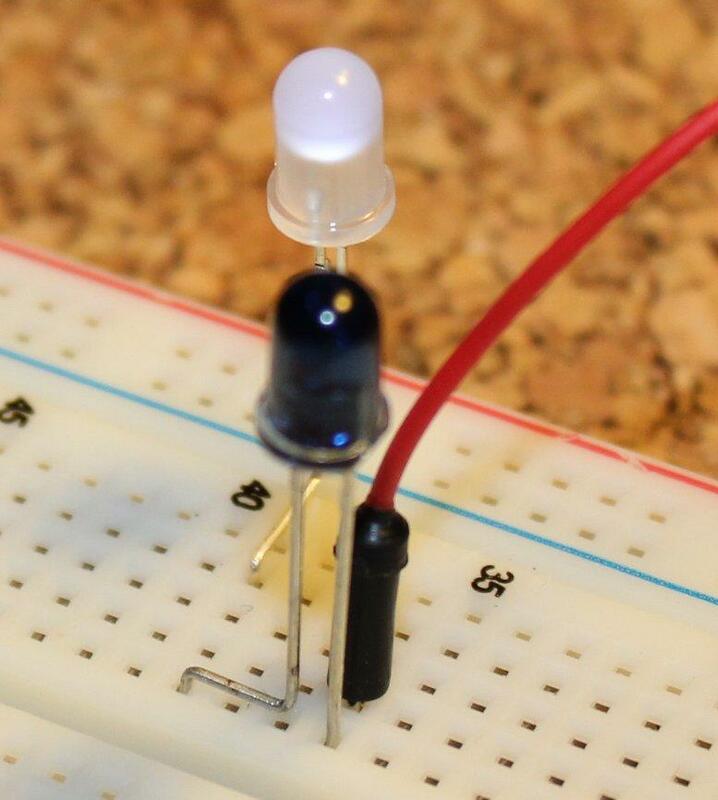 You should notice that the LED will blink brighter or fainter depending how much light falls onto the sensor (for photodiode it won't blink if it will be connected the wrong way - photodiode is also one direction only component). More fun with electronic components, sensors in next article.